If you want to save money on buying Railcards for your travels, then you came to the right place. Our massive community of bargain hunters will provide you with the best Railcard offers, deals, and voucher codes. The deals here are updated and our community of enthusiastic bargain hunters made sure that you can use the Railcard voucher codes. Good thing our team has listed the most affordable and latest Railcard deals from the most trusted and reliable online retailers. Get them from Tesco, Quidco, and National Rail with just a few clicks. Where to Buy 26-30 Railcard? 20% off Family & Friends Railcard - save £6. OFFER ENDS SATURDAY! Find the best Railcards promotional codes online! Airport trains. This includes Heathrow Express, Gatwick Express and Stansted Express. All Railcards except the Network Railcard can be used to purchase tickets on these trains. Oyster card. Off Peak Pay As You Go Fares & Off Peak Price Caps only. Holders of 16/25, Seniors and Disabled Railcards can have their Railcard discount loaded onto their Oyster Card. The discount is only triggered for off-peak travel on the Underground and DLR. Off peak Travelcard zones 1 to 6. What at first sight might seem attractive is compromised by discounts being only on zone 1 to 6 Travelcards. Most leisure visitors only need a zone 1 and 2 Travelcard which is about 20% cheaper than a zone 1 to 6 off peak Travelcard diluting much of the Railcard discount. Anytime Travelcard zones 1 to 6. You can apply your Railcard discount to anytime Travelcards if you buy it from outside London from the railways together with the railway ticket. 3-year Railcard available to buy online for £70 Average annual saving of £192 plus special partner discounts on days out, holidays, theatre, and more. Aged 16 or over Average annual saving of £184 plus partner discounts on days out, theatre and more. Make sure to choose the Railcard that suits you the best! If you're ever wondering about those people who purchase train tickets with the same as yours but their tickets are cheaper, that is because they have a railcard. 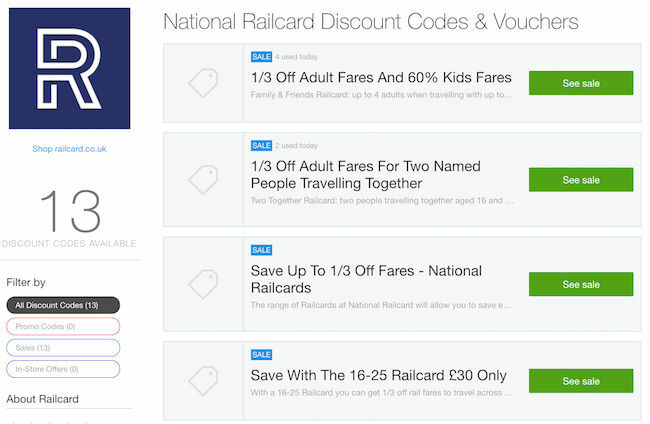 National railcard has different types but they all give you discounts and reduced rate. If you are looking for a London railcard, you’ve come to the right place! You can find all the best and the latest cheap train tickets at Latest Deals. From discounts to price drops of two together railcard, you will surely find the best deals on railcard by using My Railcard App. We have a community of bargain hunters who are always looking out for the best possible railcard deals across the UK that will provide with some serious money off on your purchases. While our team of money-saving experts are regularly sharing essential tips and tricks to help you save on your instore and online shopping. Most UK retailers regularly have sale events where you can save as much as 50% off on a wide selection of national railcards from UK. You can also enjoy London railcard price drops during Black Friday and Boxing Day. However, you can maximise your savings and get additional discounts by using Two Together Railcard promotional code and Railcards discount codes you can find here. 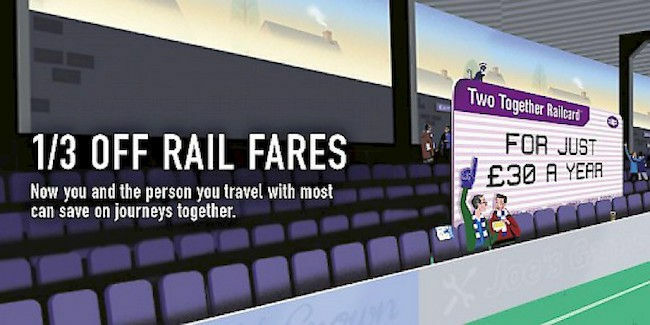 There are even voucher codes where you can buy Railcards with freebies from retailers such as Groupon, Tesco, and Quidco. The promos and offers we have here are available for a limited time only, so grab them right away before they expire. Do not forget to bookmark this page and never miss out on fantastic savings and everyday low prices from your favourite UK retailers.